Doom Bar is named after an infamous sandbank at the mouth of the Camel Estuary in Cornwall, where the river meets the Atlantic Ocean on the treacherous north coast. Distinctive aromas of toffee and dried fruit, and flavours of spicy, resinous hops have delicate roasted notes in a full, creamy delivery. Awards: Brussels Beer Challenge - Pale & Amber Ale - Bitter Bronze 2013 & 2015, International Beer Challenge Bronze (Design and Packaging) 2014, Taste of the West Award Bronze 2013, Taste of the West Award Silver 2014. At the mouth of the Camel Estuary in Rock, Cornwall, lies the treacherous Doom Bar sandbank, the inspiration for this balanced and moreish amber ale. The sandbank is revered as a formidable nautical challenge that should be approached with respect and navigated with skill. 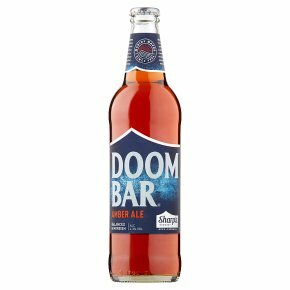 Doom Bar is a perfectly balanced beer combining subtle yet complex flavours, Doom Bar is both satisfying and deliciously moreish.